Eli Whitney was born on December 8, 1765 in Westborough, Massachusetts. He grew up on a farm. As a young man Eli helped his father operate a shop that manufactured nails for the American Revolution. The shop utilized an invention that Eli created himself. Before long, he was making hat pins and canes. Eli graduated from Yale in 1793, and then head south to South Carolina to work as a tutor. While he was in route he met the widow of a Revolutionary War general named Catherine Greene. 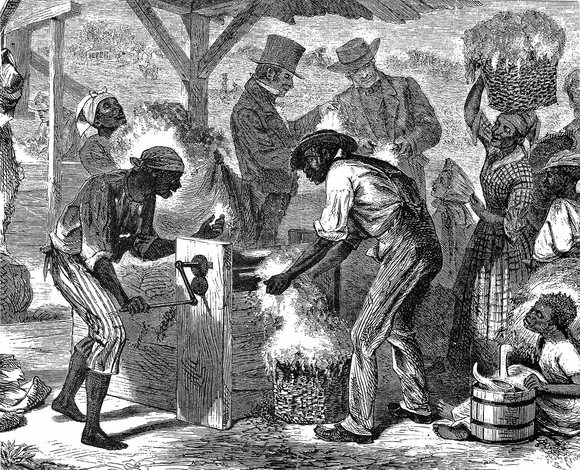 Greene told Eli Whitney that if his job did not work out that he could come to her Mulberry Plantation and read law. Eli soon learned that the tutor job was only going to pay him half the money that had been agreed upon, so he turned down the job and took up Mrs. Greene on her offer. At the Mulberry Plantation he met Catherine's finance manager Phineas Miller, who was also a Yale graduate. While there, Eli Whitney soon learned that tobacco was no longer a lucrative business and that the South lacked a key cash crop. Cotton had been cultivated by Native Americans for centuries. It was easily grown and could be stored for long periods of time. Eli soon learned that profitable long stubble Sea Island cotton could be grown along the east coast from Delaware to Georgia but not inland. Inland farmers could only plant short stubble which was not profitable because it was so labor intensive. However there was plenty of labor intensive green-seed or short stubble cotton. Unfortunately, the farmers lacked a method to extract the seeds from the cotton cheaply enough for it to be profitable. It took a slave an entire day to separate 1 pound of short stubble cotton from its seeds. At the time the textile industry was becoming more and more mechanized in both Great Britain and New England, and as a result the demand for cotton increased dramatically. Greene and Miller decided to back Eli Whitney in his attempt to create a machine that could separate the seeds. Eli Whitney worked evenings until he came up with a machine that could clean the seeds. His machine used a system of hooks, wires and a rotating brush. Before long, Eli demonstrated the machine to the local farmers who were immediately impressed. The machine could produce more cotton in an hour than a group of slaves could produce in a day. Eli called it a cotton gin, which was short for cotton engine. He secured a patent for his invention in 1794. It did not take long before farmers began to pirate his idea and create machines of their own. As a result, Whitney spent years in court battling the farmers, but even after he received a settlement from them the cotton gin still failed to bring in very much money. However, the farmers all got rich.